For the love of all things dogs, plus much more...so versatile. An eclectic mix of soft and bold patterns, rich and gentle hues, there is sure to be many hours of creating fun with this kit. 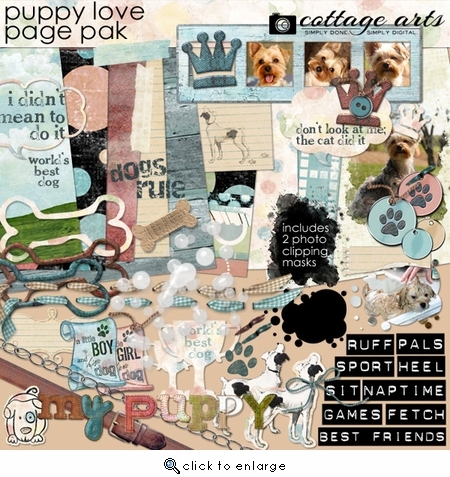 Includes 9 - 12x12 Papers (including painted grassy field/sky papers, notebook papers, lots of dots, tone-on-tone textures, barn-board, and grungy grid) and over 50 unique elements (dog tags, ties, clipping photo masks, bubbles, bone frames, bone treat, paw print, tape, string, laced ribbon, dog illustrations talk bubble and talk bubble frame, clasp backs, leather collar, labels, scrolls, crowns, trophies, and 16 word art titles [some humorous]). Thanks to Sharon Hammond for making a few of the elements. Includes link to on-line Clipping Mask Tutorial (in Usage and Instructions.txt document).